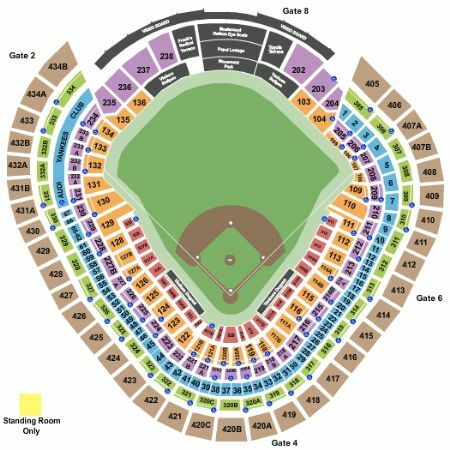 New York Yankees vs. Boston Red Sox Tickets - 6/2/2019 - Yankee Stadium in Bronx at Stub.com! Does not include admission to event. Tickets will be ready for delivery by May 29, 2019. Includes access to Audi Yankees Club & Pepsi Lounge. Mobile Entry Tickets. Must have smart device on hand to enter event. Do not print these tickets. Tickets will be ready for delivery by May 31, 2019. ADA accessible these tickets allow for wheelchair access if needed. Chairs are provided for non-wheelchair customers. First row in this section. Tickets will be ready for delivery by May 29, 2019. Second row in this section. Tickets will be ready for delivery by Jun 01, 2019. Includes access to Audi Yankees Club & Pepsi Lounge. Tickets will be ready for delivery by May 29, 2019. Aisle seats if entire quantity is purchased. Aisle Seats. Mobile Entry Tickets. Must have smart device on hand to enter event. Do not print these tickets. These seats are on the aisle with purchase of the entire group. Tickets will be ready for delivery by May 31, 2019. Aisle Seats. Tickets will be ready for delivery by Jun 01, 2019. Mobile Entry Tickets. Must have smart device on hand to enter event. Tickets will be ready for delivery by May 26, 2019. Mobile Entry Tickets. Must have smart device on hand to enter event. Do not print these tickets. Tickets will be ready for delivery by May 28, 2019. Third row in this section. Tickets will be ready for delivery by May 31, 2019. These seats are on the aisle with purchase of the entire group. Tickets will be ready for delivery by May 30, 2019. Mobile Entry Tickets. Must have smart device on hand to enter event. Do not print these tickets. Aisle seats. Tickets will be ready for delivery by Jun 02, 2019. Mobile Entry Tickets. Must have smart device on hand to enter event. Do not print these tickets. Access to Jim Beam Suite Club. Tickets will be ready for delivery by Jun 01, 2019. First row in this section. Tickets will be ready for delivery by May 31, 2019. Access to Jim Beam Suite Club. Tickets will be ready for delivery by May 29, 2019. Mobile Entry Tickets. Must have smart device on hand to enter event. Do not print these tickets. Limited view seating. ADA accessible these tickets allow for wheelchair access. Mobile Entry Tickets. Must have smart device on hand to enter event. Do not print these tickets. Tickets will be ready for delivery by Jun 01, 2019. First row in this section. Tickets will be ready for delivery by Apr 25, 2019. Aisle Seats. Tickets will be ready for delivery by May 25, 2019. Mobile Entry Tickets. Must have smart device on hand to enter event. Do not print these tickets. Aisle seats. Tickets will be ready for delivery by May 31, 2019. Mobile Entry Tickets. Must have smart device on hand to enter event. Do not print these tickets. Includes access to MVP Club Lounge. Tickets will be ready for delivery by Jun 01, 2019. Access to Delta Club. Tickets will be ready for delivery by May 31, 2019.